What is this fruit in my beer and where can I get more of this? Beers are becoming more and more fruity. Both in terms of the most popular hop varieties today adding fruit-like aromas to the beer, and actual fruit being added in the brewing process. This trend towards fruit in craft beers has been a while coming but has seemingly reached its zenith of late with the birth of the ‘juicy’ New England IPA (NEIPA) style beers, the proliferation of pale ales with fruit added, and the uptick in sessional sour beer styles like Gose and Berline Weisses that often include the addition of fruits. The trendiest hops right now are varieties like Citra, Mosaic, Galaxy, and, in New Zealand, Nelson Sauvin, which impart distinctively fruity aromas to the beer. 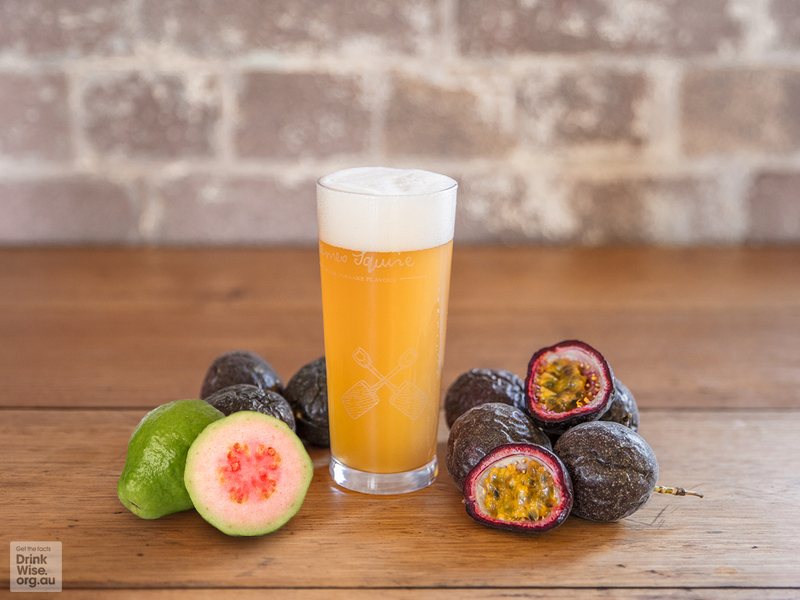 Passionfruit, melon, tropical punchbowl, citrus, are all common flavours associated with these hops. This is in stark contrast to hop varieties used previously in the West Coast IPAs, like Centennial, Columbus and Chinook, which were piney, resinous, and bitter. The new fruitier IPAs, and in particular the New England IPAs (NEIPAs) are a stylistic counterpoint to these brash bitter IPAs, and tend to be more approachable with lively fruity flavours and a toned-down bitterness. It’s taken years of hop innovation to breed these fruitier styles that are now so sought after but styles like NEIPAs are still somewhat polarising among seasoned beer drinkers. Even if its immediate appeal is broader, some beer afficianados find these beers lacking in bitterness and, well, beeriness. Nevertheless, these hoppy fruity beers continue to be a drawcard for drinkers and the hype train shows no signs of stopping anytime soon. Feral’s Biggie Juice – another super juicy but approachable beer that is thick and cloudy. Hop Nation’s Jedi Juice – lots of mango and citrus and plenty of hazy and body, this is my favourite example of the NEIPA style yet. 8 Wired Hopwired IPA – This is the first beer I remember blowing me away by how fruity it was, you could smell it from across the room! Fruity NZ hops at their best. Pirate Life Mosaic IPA – Mosaic may be the hottest hop variety right now and this is a typically excellent example from the hop masters at Pirate Life. Stone & Wood Pacific Ale – an oldie but a goldie, a pale and thin bodied ale, allowing the fruit aromas from the Galaxy hops to really shine through. One of my favourite modern examples of fruit being added to a beer is the Blood Orange Gose from California’s Anderson Valley Brewing (pictured). The beer was trendsetter in this sessionable sour category and tastes somewhat like an alcoholic version of a San Pellegrino Aranciata Rossa, which works surprisingly well. In Australia, Wayward’s Sourpuss Raspberry Berliner and Nomad’s Saltpan Desert Lime Gose are two other fantastic examples of using fruit additions to accentuate and add complexity to these refreshing beer styles. Brewers are also adding fruit to beer styles with fruity hops, using fruit additions to further exaggerate flavours and add complexity. Ballast Point’s Grapefruit Sculpin and Pineapple Sculpin, for instance are two popular fruit-added varieties of the US brewery’s seminal IPA. One local example of a fruit-added IPA worth seeking out is Green Beacon’s Blood Orange IPA. The fruit adds to the citrus aromas present from the hops and creates a distinctive and moreish beer. Other recent local releases in this space include James Squire’s Tropicana Ale (pictured), which was an intriguing thirst quencher reminiscent of guava juice. Another couple of exciting releases, which I haven’t sampled yet but look forward to are Two Birds’ Passion Victim Summer Ale, brewed with passionfruit puree, and Stockade’s Two Bridges, brewed in collaboration with Brazilian brewery Dadiva, which also uses the addition of passionfruit to complement the Galaxy hops used. You should try the Coconspirators NEIPA “Matriarch”, it’s the best I’ve had to date. I’m surprised you didn’t mention the excellent Boatrocker “Miss Pinky” as an example of local Beer with Fruit. Cheers for the tip, will put that on my list! Agree with you Miss Pinky is another good one too. Cheers!